Original Antique Maps and Prints. 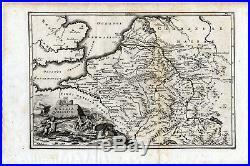 Antique map-ANCIENT BELGIUM-NETHERLANDS-FRANCE-GALLIA BELGICA-Cellarius-1731. Description: This authentic print originates from:’Notitia orbis antiqui, sive geographia plenior ï¿½’, by Christoph Cellarius, ed. Published in Leipzig by Johann Frederick Gleditsch in 1731-32. An early standard work on the geography of Classical Antiquity first published in 1686. Artists and Engravers: Author: Christoph Cellarius (1638 – 1707) or Christopher Keller was a German scholar, historian and textbook publisher. Cellarius held academic positions in both Weimar and Halle. Cellarius’s most important work was his 1683 publication of’A Universal History Divided into an Ancient, Medieval, and New Period. It was in this work that the concept of history as divisible into three distinct periods (Ancient History, Mediaeval History, and Modern History) was introduced. It had great impact on the way future historians would interpret the past. Subject: Map:’Gallia Belgica. With decorative cartouche showing Poseidon, river gods and putti’s. Condition: Very good given age. General age related toning. Paper edges a bit irregular from binding. Original folds as issued. Please study scan carefully. Size (in cm): The overall size is ca. 36 x 24 cm. The image size is ca. 30 x 20 cm. Size (in inch): The overall size is ca. 14.2 x 9.4 inch. 11.8 x 7.9 inch. Medium: Original copperplate engraving on verge type hand laid paper. ThePrintsCollector – Laurentius Old Master Prints Peter Cornelissen, Frans Laurentius, Joost Bos Margo van Latum-van Dongen, Frank van Latum Located in Zeeland (Noord-Brabant) – The Netherlands. GO TO OUR STORE and explore our huge collection of fine antique maps and prints. The item “Antique map-ANCIENT BELGIUM-NETHERLANDS-FRANCE-GALLIA BELGICA-Cellarius-1731″ is in sale since Tuesday, July 15, 2014. This item is in the category “Antiques\Maps, Atlases & Globes\Europe Maps”. The seller is “theprintscollector” and is located in Zeeland. This item can be shipped worldwide.